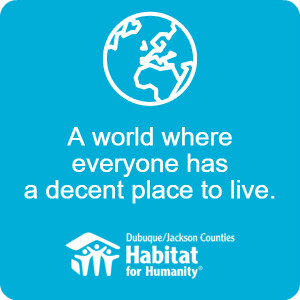 Like Habitat for Humanity International, Habitat for Humanity Dubuque and Jackson Counties is founded on the conviction that every man, woman, and child should have a simple, decent, affordable place to live in dignity and safety. We provide a powerful opportunity for all people to put their core beliefs about justice, loving our neighbors, equity and the environment into bricks and mortar action. Whether through prayer, financial support or volunteer work, faith organizations are part of the backbone of our work. 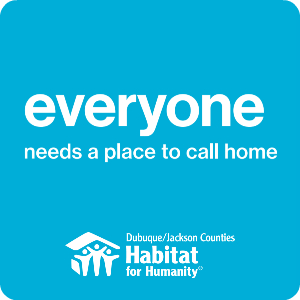 Encourage your congregation to include Habitat for Humanity Dubuque and Jackson Counties in its mission budget. Take up special offerings for Habitat. Provide in-kind goods and services. (For example, a plumber in your congregation might volunteer to do the plumbing work on a Habitat house. )-Participate in the International Day of Prayer for Habitat for Humanity on the third Sunday in September. Donate lunch and snacks for volunteers on build sites. Invite a Habitat representative to come to your house of worship to share our story, to learn more about the need for affordable housing and to learn ways you can get involved. Build strength and unity within your congregation as you work toward the common goal of helping others.